Welcome back to Constellation Friday! 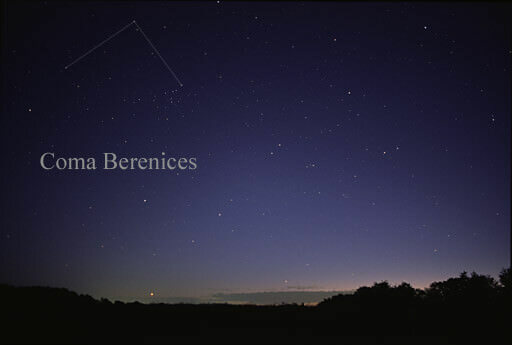 Today, in honor of the late and great Tammy Plotner, we will be dealing with “Berenice’s Hair” – the Coma Berenices constellation! One of these is the constellation Coma Berenices, an ancient constellation located in the norther skies. In the Almagest, Ptolemy considered the asterism to be part of the constellation Leo. Today, it is one of the 88 constellations recognized by the International Astronomical Union, and is bordered by the constellations of Canes Venatici, Ursa Major, Leo, Virgo and Boötes. In mythology, it is easy to see why this dim collection of stars was once associated with Leo and considered to be the tuft of hair at the end of the Lion’s tail. However, as the years passed, a charming legend grew around this sparkling group of stars. Since the time of Ptolemy, this grouping of stars was recognized and although he didn’t list it as one of his 88 constellations, he did refer to is as “Berenice’s Hair”. As legend would have it, the good Queen Berenice II of Egypt offered to sacrifice her beautiful long hair to Aphrodite for the safe return of her husband from battle. When she cut off her locks and placed it on the altar and returned the next day, her sacrifice was gone. To save his life, the court astronomer proclaimed Aphrodite had immortalized Berenice’s gift in the stars… and thus the Lion lost his tail and the astronomer saved his hide! Like many of the 48 constellations recognized by Ptolemy, Coma Berenices traces it routes back to ancient Mesopotamia. To Babylonian astronomers, it was known as Hegala, which translated to “which is before it”. However, the first recorded mention comes from Conon of Samos, the 3rd century BCE court astronomer to Ptolemy III Euergetes – the Greek-Egyptian king. It was named in honor of his consort, Berenice II, who is said to have cut off her long hair as a sacrifice to ensure the safety of the king. The constellation was named “bostrukhon Berenikes” in Greek, which translates in Latin to “Coma Berenices” (or “Berenice’s hair”). Though it was previously designated as its own constellation, Ptolemy considered it part of Leo in his 2nd century CE tract the Almagest, where he called it “Plokamos” (Greek for “braid”). The constellation was also recognized by many non-western cultures. In Chinese astronomy, the stars making up Coma Berenices belonged to two different areas – the Supreme Palace Enclosure and the Azure Dragon of the East. Eighteen of the constellation’s stars were in an area known as Lang wei (“seat of the general”). To Arabic astronomers, Coma Berenices was known as Al-Du’aba, Al Dafira and Al-Hulba, forming the tuft of the constellation Leo (consistent with Ptolemy’s designation). 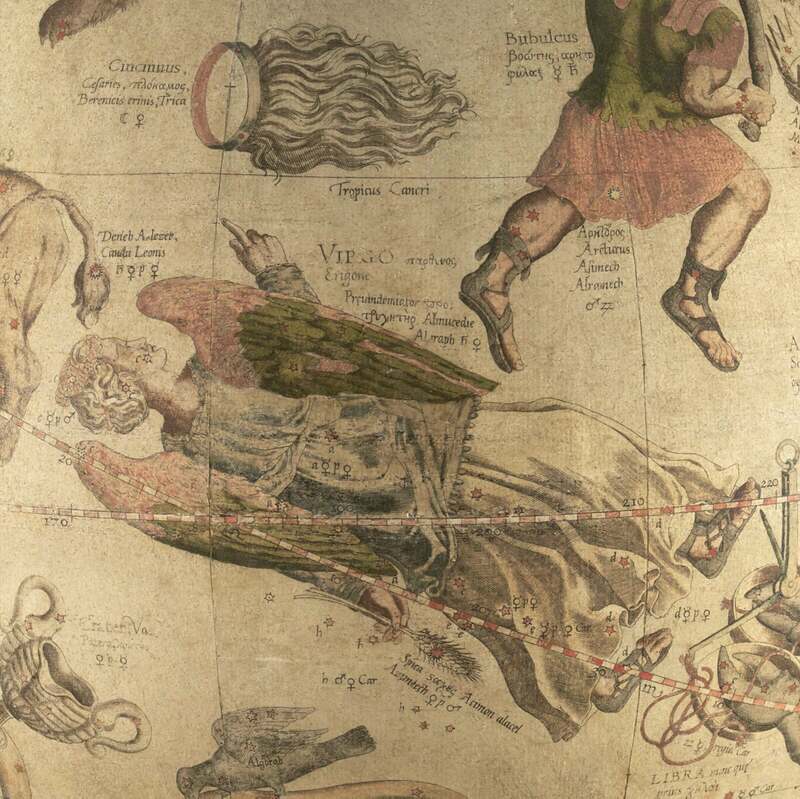 By the 16th century, the constellation began to be featured on globes and maps produced by famed cartographers and astronomers. In 1602, Tycho Brahe recognized it as its own constellation and included it in his star catalogue. In the following year, it was included in Johann Bayer’s famed celestial map, Uranometria. In 1920, it was included by the IAU in the list of the 88 modern constellations. Despite being rather dim, Coma Berenices is significant because it contains the location of the North Galactic Pole. It is comprised of only 3 main stars, but contains 44 Bayer/Flamsteed designated members. Of its main stars, Alpha Comae Berenices (aka. Diadem) is the second-brightest in the constellation. The name is derived from the Greek word diádema, which means “band” or “fillet”, and represents the gem in Queen Berenice’s crown. It is sometimes known by its other traditional name, Al-Zafirah, which is Arabic for “the braid”. It is a binary star composed of two main sequence F5V stars that are at a distance of 63 light years from Earth. It’s brightest star, Beta Comae Berenices, is located 29.78 light years from Earth and is a main sequence dwarf that is similar to our Sun (though larger and brighter). It’s third major star, Gamma Comae Berenices, is a giant star belonging to the spectral class K1II and located about 170 light years from Earth. Coma Berenices is also home to several Deep Sky Objects, which include spiral galaxy Messier 64. Also known as the Black Eye Galaxy (Sleeping Beauty Galaxy and Evil Eye Galaxy), this galaxy is located approximately 24 million light years from Earth. This galaxy has a bright nucleus and a dark band of dust in front of it, hence the nicknames. Then there is the Needle Galaxy, which lies directly above the North Galactic Pole and was discovered by Sir William Herschel in 1785. It is one of the most famous galaxies in the sky that can be viewed edge-on. It lies at a distance of about 42.7 million light years from Earth and is believed to be a barred spiral galaxy from its appearance. Coma Berenices is also home to two prominent galaxy clusters. These includes the Coma Cluster, which is made up of about 1000 large galaxies and 30,000 smaller ones that are located between 230 and 300 million light years from Earth. South of the Coma Cluster is the northern part of the Virgo Cluster, which is located roughly 60 million light years from Earth. Other Messier Objects include M53, a globular cluster located approximately 58,000 light years away; Messier 100, a grand design spiral galaxy that is one of the brightest members of the Virgo cluster (located 55 million light years away); and Messier 88 and 99 – a spiral galaxy and unbarred spiral galaxy that are 47 million and 50.2 million light years distant, respectively. Coma Berenices is best visible at latitudes between +90° and -70° during culmination in the month of May. There is one meteor shower associated with the constellation of Coma Berenices – the Coma Berenicid Meteor shower which peaks on or near January 18 of each year. Its fall rate is very slow – only one or two per hour on average, but these are among the fastest meteors known with speeds of up to 65 kilometers per second! For both binoculars and telescopes, Coma Berenices is a wonderland of objects to be enjoyed. Turn your attention first to the brightest of all its stars – Beta Coma Berenices. Positioned about 30 light years from Earth and very similar to our own Sun, Beta is one of the few stars for which we have a measured solar activity period – 16.6 years – and may have a secondary activity cycle of 9.6 years. Now look at slightly dimmer Alpha. Its name is Diadem – the Crown. Here we have a binary star of equal magnitudes located about 65 light years from our solar system, but it’s seen nearly “edge-on” from the Earth. This means the two stars appear to move back-and-forth in a straight line with a maximum separation of only 0.7 arcsec and will require a large aperture telescope with good resolving power to pull them apart. If you do manage, you’re separating two components that are about the distance of Saturn from the Sun! Another interesting aspect about singular stars in Coma Berenices is that there are over 200 variable stars in the constellation. While most of them are very obscure and don’t go through radical changes, there is one called FK Comae Berenices which is a prototype of its class. It is believed that the variability of FK Com stars is caused by large, cool spots on the rotating surfaces of the stars – mega sunspots! If you’d like to keep track of a variable star that has notable changes, try FS Comae Berenices (RA 13 3 56 Dec +22 53 2). It is a semi-regular variable that varies between 5.3m and 6.1 magnitude over a period of 58 days. For your eyes, binoculars or a rich field telescope, be sure to take in the massive open cluster Melotte 111. This spangly cloud of stars is usually the asterism we refer to as the “Queen’s Hair” and the area is fascinating in binoculars. Covering almost 5 full degrees of sky, it’s larger than most binocular fields, but wasn’t recognized as a true physical stellar association until studied by R.J. Trumpler in 1938. Now turn your attention towards rich globular cluster, Messier 53. Achievable in both binoculars and small telescopes, M53 is easily found about a degree northwest Alpha Comae. At 60,000 light years away from the galactic center, it’s one of the furthest globular clusters away from where it should be. It was first discovered by Johann Bode in 1755, and once you glimpse its compact core you’ll be anxious to try to resolve it. With a large telescope, you’ll notice about a degree further to the east another globular cluster – NGC 5053 – which is also about the same physical distance away. If you study this pair, you’ll notice a distinct difference in concentrations. The two are very much physically related to one another, yet the densities are radically different! Now put your telescope on Messier 100 – a beautiful example of a grand-design spiral galaxy, and one of the brightest galaxies in the Virgo Cluster. This one is very much like our own Milky Way galaxy and tilted face-on, so we may examine the spiral galaxy structure. Look for two well resolved spiral arms where young, hot and massive stars formed recently from density perturbations caused by interactions with neighboring galaxies. Under good observing conditions, inner spiral structure can even be seen! Try lenticular galaxy Messier 85. In larger telescopes you will also see it accompanied by small barred spiral NGC 4394 as well. Both galaxies are receding at about 700 km/sec, and they may form a physical galaxy pair. How about Messier 88? It’s also one of the brighter spiral galaxies in the Virgo galaxy cluster and in a larger telescope it looks very similar to the Andromeda galaxy – only smaller. How about barred spiral galaxy M91? It’s one of the faintest of the Messier Catalog Objects. Although it is difficult in a smaller telescope, its central bar is very strong in larger aperture. Care to try Messier 98? It is a grand edge-on galaxy and may or may not be a true member of the Virgo group. Perhaps spiral galaxy Messier 99 is more to your liking… It’s also another beautiful face-on presentation with grand spiral arms and a sweeping design that will keep you at the eyepiece all night! There are other myriad open clusters and just as many galaxies waiting to be explored in Coma Berenices! It’s a fine region. Grab a good star chart and put a pot of coffee on to brew. Comb the Queen’s Hair for every last star. She’s worth it.